Prominent names top our list of most active corporates: Google Ventures, Intel Capital, Qualcomm Ventures, Salesforce Ventures and Comcast Ventures. The number of corporations strategically investing in private companies has enjoyed an upward trend in recent years, across industries including healthcare, media, finance, and energy. 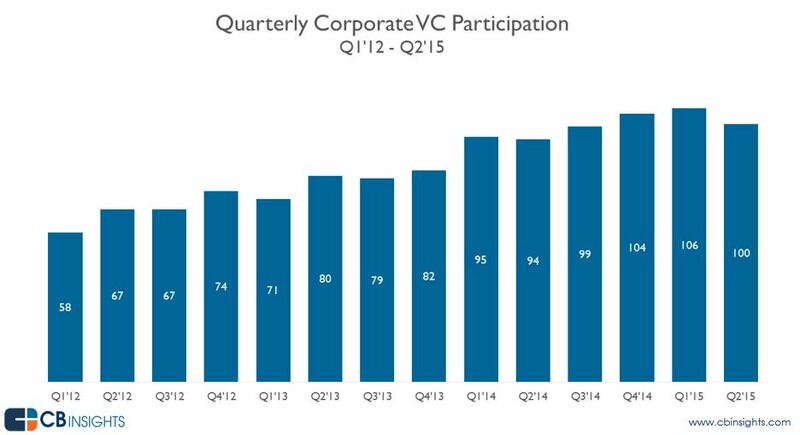 In Q1’15, 106 different corporate venture capital arms (CVCs) completed a US investment — a multi-year high. That’s an 82% jump from the same quarter three years ago, according to CB Insights data. There was a slight dip to 100 CVCs making a US investment in Q2’15. A comprehensive and data-driven look at the most active corporate investors in 2017. Despite a deal slowdown in 2015, Google Ventures tops the list of most active CVC investors over the last four quarters with over 60 new and follow-on deals. Tech corporations dominate the top slots on the list, with Intel Capital, Qualcomm Ventures and Salesforce Ventures joining Google Ventures in the top four. Healthcare-focused CVCs are well-represented among the top 20 most active. The healthcare players include Novartis Venture Funds, Pfizer Venture Investments and Lilly Ventures among others. Below is the list of 117 active corporate venture arms in the last four quarters. Get the ‘Benchmarking Corporate Venture Capital‘ presentation. Want more corporate venture data? Sign up for the CB Insights Venture Capital Database free below.